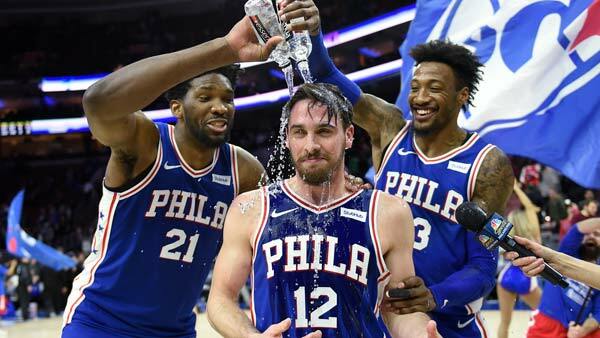 76ers guard T.J. McConnell made franchise history on Monday when he became the first Sixer to record a triple-double off the bench. McConnell had 10 points, 11 assists and 10 rebounds in a 108-92 win over the New York Knicks. "It was amazing. I'm happy for him and I'm glad that he did it. If we want to go where we want to, he'll be one of those reasons," 76ers center Joel Embiid said of McConnell, who also had a career-high six steals against the Knicks. "He comes in and plays with great energy; he hypes the crowd up. Defensively, he was great, and he moves the ball well." The Wells Fargo Center crowd -- and McConnell's teammates on the bench -- exploded in celebration when McConnell grabbed a rebound with 1:05 to play to seal the triple-double. McConnell said jokingly afterward that Embiid was prodding him to fish for that final rebound. "Well, Joel just wouldn't let it go," McConnell said. "Just after a rebound or an assist he kept telling me, and then when I had nine rebounds he was saying, 'Get another one' -- and someone went up and blocked out the big guy, and it just kind of fell into my hands. It was like it was in slow motion." McConnell was one of six Sixers to score in double figures against the Knicks. He's the 25th player to post a triple-double off the bench since 1963-64, according to Basketball-Reference.com. McConnell, 25, signed with the Sixers as an undrafted free agent in 2015. "You respect him, you really respect him. He just plays so hard," Sixers coach Brett Brown said of McConnell. "He's a wonderful lesson for so many basketball players in relation to what determination, perseverance, toughness can bring you to. We've seen him grow; he continues to get better, and tonight he was incredible." Philadelphia improved to 29-25 with Monday's win, already surpassing the club's win total from 2016-17. The 29 wins are the Sixers' highest total before the All-Star break since their 2000-01 campaign. Philadelphia has the best winning percentage in the Eastern Conference since Christmas Day (15-7) and has won eight straight home games.